Members of the official Sting.com fan club who were unable to access tickets to the first performances will have a second opportunity to purchase for the newly announced dates beginning Friday, November 18th at 10:00 am PST through Sunday, November 20th @ 5pm. Details at on the Tour page. Tickets for the 2nd performances will be available for Citi cardmembers starting today (Thursday, November 17th) at 1pm PST through Sunday, November 20th at 5pm (all times local). For complete pre-sale details visit: www.citiprivatepass.com. Tickets for both performances in San Francisco – Sunday, February 5th and Monday, February 5th at the Masonic, and Wed. Feb. 8th and Thursday Feb. 9th at the Los Angeles Palladium will go on sale to the public Monday, November 21st at 10am. 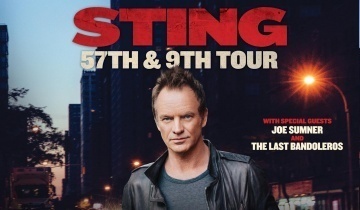 In North America, every ticket purchased online includes a digital download of Sting’s new album “57th & 9th.